1 Why Do You Need a Dive Knife? 9 How to Care For Your Dive Knife? Talk about being in a bad situation. While he was fighting to get out, he damaged his speargun while trying to untangle himself. If he didn’t have my dive knife, he probably would have died. He was thankful he had a quality one when the moment called! Don’t go out diving without one. Even if you think you’ll be doing an easy dive, something unexpected can happen. Your dive knife is the most important piece of your spearfishing arsenal. Spearfishing is inherently risky, however, if you have a quality knife, you reduce it dramatically. Although spearfishing is a fascinating hobby, it can be dangerous. From a young age, my friend in the story has been fascinated with spearfishing. After talking with him, I wanted to share his insights with you through this article. There are ample products on the market and it might be quite tricky to make the right decision. Don’t worry fellow spearfishing enthusiasts! I’ve prepared a detailed list with the seven best dive knives that will bring you to the next fishing level! It’s not uncommon that you’ll get tangled in fishing line, rope or old fishing nets. However, you cannot use a traditional knife to cut yourself loose as they are not able to withstand the harsh ocean elements. You need a dive knife that will do what’s asked of it. If you are asking: why should I use a special dive knife and not a typical knife? What’s the best blade material? Whether you free dive, scuba, or spearfishing, you will need something sharp that is able to cut lines, nets or ropes. It is the only tool that can help you avoid entanglements and also protect you from aggressive fish like amberjack or marlin. Some types of monofilament lines or lead core line are nearly impossible to cut with a simple knife or trauma shears. Regardless of what you want to cut, the dive knife is the only tool that will help you out. Beyond this, the dive knife is a multi-purpose piece of equipment! Most knives have a large handle that you can use as a hammer. Another thing that you should take into consideration is the fact that most dive knife blades are black or dark grey. Why? The experienced fisherman knows the answer! Shiny objects can bring about the attention of predator fish that can lead to dangerous situations especially if they are big bloodthirsty predators! The reflected light can also scare away small fish. This isn’t a big problem while the knife is in its sheath. 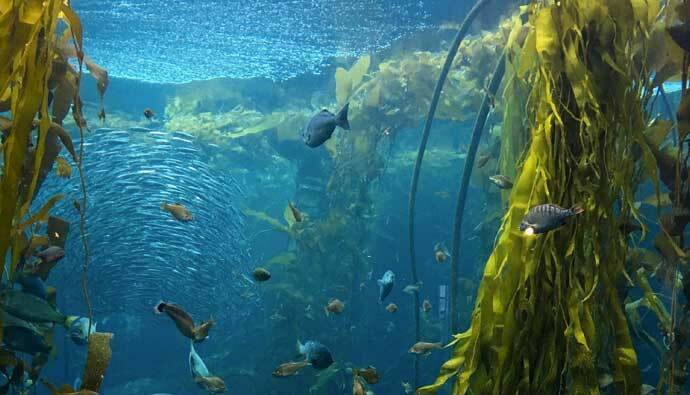 It only becomes a problem when you are braining a fish and have blood around you which is already a dangerous situation…why further attract hungry fish eager to collect their tax? Spearfishing rule number one: A dive knife will always come in handy. Before you make any decision, you should learn the parts of a dive knife. It consists of a blade and a handle and they come with a convenient sheath or you can just attach them to your belt with a strap. A fixed blade dive knife is larger than a folding knife and it is a huge perk if you need to cut something quickly. These knives come with a solid sheath where you can store them safely. You should keep in mind that the sheath is the only thing that keeps your knife close to you. A folding dive knife is the safest option when it comes to spearfishing. It is a compact knife and you can find it with different locking mechanisms. The only downfall here is that it is not really convenient to open a folding knife with one hand. Dive knives typically have a blunt point, pointed top, and are either serrated or plain edge. The blade shape you want depends on your preference based on how you dive. A good choice for most spearos would be a stiletto dive knife because they are easy to brain fish. Pointed Tip: Since you are spearfishing, you will definitely come across predatory fish and some of them are really dangerous. You will need something to kill them before they hurt you. Most spearos use pointed tip knives to kill their catches humanely so that they do not suffer. Be a respectful angler and kill your fish quickly. Blunt Tip: On the other hand, a pointed tip knife is extremely dangerous because you can accidentally stab yourself or ruin your wetsuit. A blunt tip knife reduces the accidental stabbing of yourself and is the right tool if you need something to cut lines, ropes or clean your boat. Stiletto Knife: The majority of spearfishing knives are stiletto knives which translates into high blade penetration and sharpness. They are extremely lightweight and handy. The stiletto blade is quite thin and has a needle-like point. Serrated Edge Knife: True to its name, this knife utilizes a serrated, tooth-like edge. 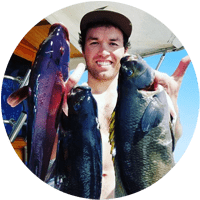 When it comes to spearfishing, a serrated edge knife is absolutely necessary as it is more efficient than a plain edge knife. It works like a small saw and it is able to cut thick ropes. Generally speaking, it works great on hard materials. You already know how important a dive knife is, however, it does you no good if you can’t access it at the critical time. You’ll need to pick a place to mount the knife to your body that’s easy to reach, is comfortable on you, and mounted securely so it doesn’t fall off easily. Many spearos add a knife to their ankle. Although this is common, it’s not the best place to place it because it can be hard to reach especially if your upper body is trapped and you don’t have a way to reach your ankle. Some people prefer to strap their knife around their thigh especially if they are freedive spearfishing. It is comfortable and you do not have to sacrifice maneuverability but you must be careful if you are using a stiletto knife as you might stab yourself when putting the knife back in the sheath. If you are diving or spearfishing in weedy or rocky environments, attaching the knife to your waist belt is the only way to avoid entanglements. If you are using a knife with a sheath, you can run through a cord and attach it to your waist belt. Just make sure that you secured the knife. If you ask a room full of spearos you’ll hear many perspectives on which blade material is best for spearfishing. We’ll cover the pros and cons of each material, but know that having one or two knives of either material is better than no knife at all. First of all, titanium is a lightweight, hard and holds an edge well. Personally, I use a titanium dive knife because I forget to take care of my equipment and titanium doesn’t rust or corrode nearly as much as stainless steel. I rarely sharpen it and it is super comfortable when I have to cover long distances. Moreover, it is slightly better for saltwater conditions as it is considered to be a better material than steel. However, titanium knives are far more expensive than steel knives. This is the main reason why most people purchase steel knives. Stainless steel isn’t as robust as than titanium but it’s more affordable. If you take care of your steel knife, you will have it for many years. Stainless steel knives are quite heavy and they are not recommended for many hours of spearfishing. Plus, you will have to sharpen it after a few fishing trips. Navy seals know that the knife is an important piece of gear. Carrying a knife is a matter of death and life and sometimes it might be useful to protect our own or a buddy’s life. Seven years ago, some Somali pirates hijacked a yacht and killed four Americans until a member of the US special operations boarded the yacht and killed one with a knife. (Source https://www.cbsnews.com/news/4-americans-on-hijacked-yacht-dead-off-somalia/). 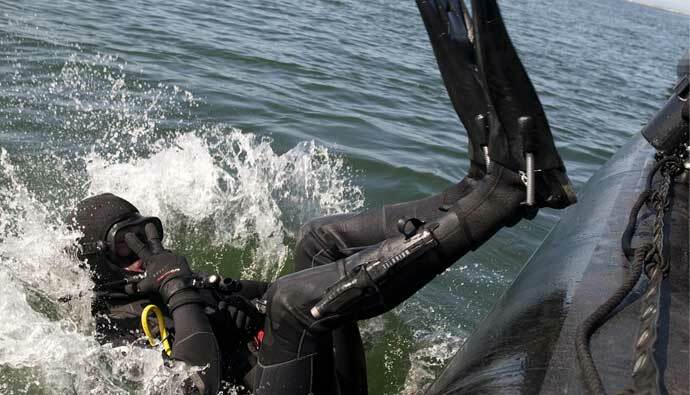 The Navy Seals use a navy dive knife to protect themselves as it is a multi-purpose tool. 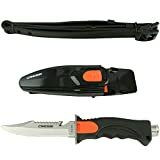 If you are a scuba diver then you should have been told how important it is to bring along a quality scuba dive knife. A scuba divers knife could save your life. 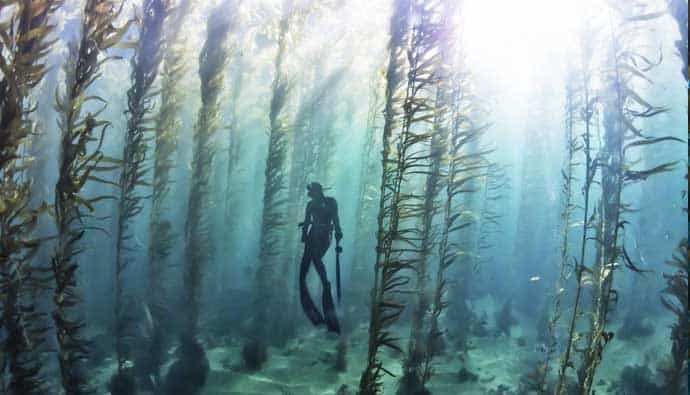 Being trapped in something is a bad experience especially if you are a newbie scuba diver! Since you are not killing fish and have no need to pierce anything, you should opt for a blunt tip knife to prevent the accidental stabbing of yourself underwater. The mounting options are ample but this depends on your personal preference. Whether you are going to store the knife in your BCD pocket or anchor it to your belt, you can be sure that you will not lose it. A scuba diver might not use the knife on every dive, but it must always be there in case of an emergency situation. If you are looking for a knife that focuses on innovation and quality, a Benchmade knife is the perfect fit for you. With a rich history of constructing the perfect knife, they managed to create durable products and even supply the military. This brand dominated the market since 1979 and most people put trust in Benchmade knives as they are made to last a lifetime. Atomic Aquatics. A brand dedicated to creating the best diving equipment that will bring you to the next diving and spearfishing level. They use exceptional materials and cutting-edge technologies. The result? Extremely versatile knives. The founders say that their equipment is a reflection of their personal philosophy. Furthermore, since we are talking about top brands, we should definitely mention Aqualung which dominated the market since 1943. The Titanium Squeeze Stiletto knife is one of their most popular and best selling products. This well-known brand ensures you that their products will pass the test of time. Snorkeling, diving, and spearfishing…All these great activities and memories are associated with one brand and it is Cressi. Cressi is an Italian brand and designs quality gear. It has established a good name in the spearfishing community and to create revolutionary and affordable products. When quality meets innovation, Tekna is always there to prove that you will invest your money in a high-quality product. It is an American company that designs diving lights and diving equipment. They are not only concerned about creating really good products but also dedicated to protecting the environment. They use 20% pre-consumer plastic scrap and recyclable packages. This is a widely-known brand for distributing scuba masks, fins, snorkels, gear bags, scuba accessories and dive wear. They have a good reputation and gained many loyal customers. All Scubapro knives utilize a really sharp blade and a superior design that will meet every spearfishing enthusiast’s expectations. Forty years ago, Spyderco created their first folding knife that changed the history of folding knives. Since then, Spyderco managed to create numerous knife types and equipped them with extraordinary features that you will not find in other knives. They pay special attention to the details and make sure that every product will have an exceptional performance. All Spyderco knives come with a warranty and so you will be sure that you will have it for many years. Choosing the best dive knife doesn’t have to be as complicated as the market makes it seem. Here are the items you should take into consideration before purchasing a knife. Firstly, you should ask yourself where you are going to anchor your knife. Size does not play an important role but if you want a long knife, you will be not able to attach it to your belt. A medium size, 3.5-inch blade is a good size. Gone are the days when spearfishing lovers used long knives strapped to their leg. Secondly, a good knife material is something that you should definitely take into account. We talked about the blade material (titanium vs steel) and now it’s time to choose a handle material. Most handles are made of heavy-duty plastic and they are covered with ergonomic anti-slip rubber grips. Moreover, there are many handle butts that can be used as a hammer. The choice depends on you. As far as the blade is concerned, titanium is the best material but if you are on a budget you can choose a steel knife. Remember that you get what you pay for. Investing in a high-quality knife is the best thing that a spearfisher could do as it will pay him off. How to Care For Your Dive Knife? Lastly, taking care of your dive knife is a process that you shall not overlook. Saltwater is a factor that can ruin your equipment completely. Luckily, there are several steps that you could follow in order to prolong your knife’s life. After Every Dive: Rinse not only your knife but also your sheath and dry it properly. You can apply a special silicone coat that protects the blade. How to Clean A Dive Knife: Before using the knife, you will have to inspect it carefully. If you see any rust mark, you can remove it with a toothbrush and apply some non-petroleum base coat. How to Sharpen a Dive Knife: If your knife became dull, it’s time to sharpen it. You will face this situation with stainless steel knives as they tend to be softer than titanium knives. There are two ways to sharpen your knife. You can sharpen it either with a sharpener or a whetstone. Do not forget that almost all whetstones should be submerged in water before using them. This is a great value product made of Japanese stainless steel. It is able to withstand saltwater corrosion and the elements of nature like a real warrior. The Cressi Skorpion knife is not only sharp but also practical as it comes with a high-quality sheath. 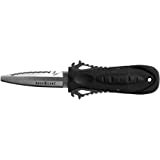 This is a small Aqualung dive knife with a blunt tip. We would recommend it to all beginner divers or spearfishing newbies as it is a great tool to start out with. If you are looking for a stainless steel dive knife, you should definitely consider this Aqualung Squeeze model. If you are looking for a high-value product that will pass the test of time, the Promate KF510 will not let you down. 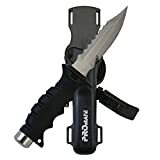 This is a multi-purpose dive knife with extraordinary and useful features. What is not to love about this titanium blade knife? If you choose this knife, you will definitely forget the word “maintenance” as it is a heavy-duty knife. It comes in different colors and you can select between a blunt or pointed tip. A folding knife is the best thing since sliced bread! If you take a closer look at this Spyderco Pacific Salt tool you will realize that it is not just another typical knife. 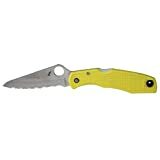 It utilizes a new steel material called H1 and Spyderco promises that it will never rust. With this riffle terminator spearfishing dive knife, you will definitely forget the threat of entanglement. The 420 stainless steel blade is sharp and allows you to cut various materials. It is a good quality and excellent value-for-money knife with a 4.5-inch blade. Finally, it is not all about the gear, right? 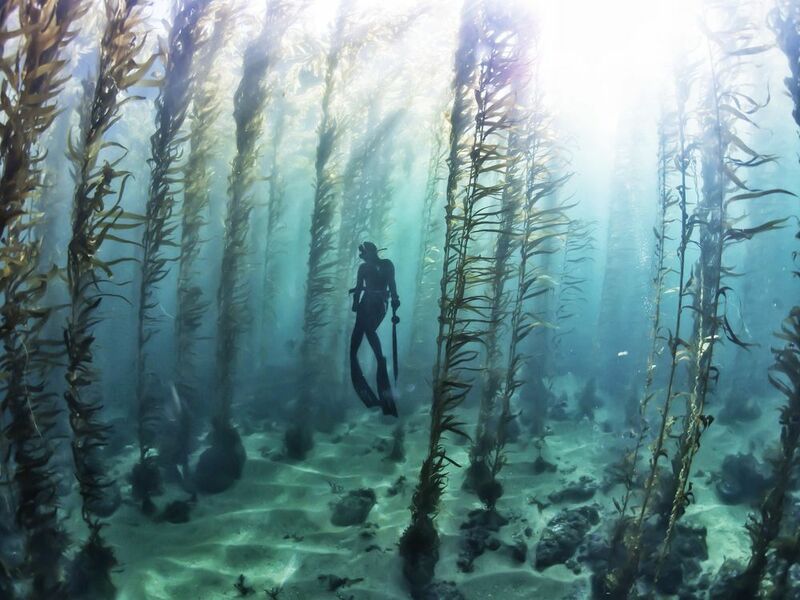 Spearfishing is one of the most adventurous outdoor activities! Make sure that you mark your spot with a float and you are ready to spear fish! 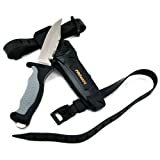 As far as the best dive knife is concerned, we would recommend the Riffle Terminator Knife as it is not only versatile but also includes a convenient sheath. The blade seems to be extra sharp and the sheath is also self-locking. Thank you for reading our article. We would be more than happy to hear your opinion. If you are ready to share your ideas or comments, please do not hesitate to leave a comment in the comment box below.